While many educators make the decision to enter the field after pursuing other careers, these students have already made the commitment to the education profession. It’s beautiful to watch the students make this commitment together, knowing that many of them are standing next to their best friends and future colleagues. I have been asked to attend tonight’s ceremony to represent the alumni community by distributing the pins to each junior as they walk across the stage. I cannot wait to attend, meet this class of aspiring educators, and be inspired by the night’s speakers. Each year, one student is selected to address the class and I was honored to have been selected as the student speaker my junior year. In honor of tonight’s event, I thought I would post the speech I gave on February 22, 2008. Full text below. I have wanted to be a teacher for my entire life. Well, almost. For about one month during kindergarten I really wanted to be a hairdresser. Then my mom told me if I were a hairdresser I would have to stand all day, and that ended that. It turns out that teachers spend most of the day standing too. However, if we, as future educators, must stand all day to teach, to reach, to encourage, to love, and to inspire young minds, then that is a cause I am willing to stand for. The Dean Emeritus of Marsh Chapel, Howard Thurman, passionately stated, “Don’t ask yourself what the world needs, ask yourself what makes you come alive. And then go do that. Because what the world needs is people who have come alive.” The world is suffering from a severe shortage of qualified teachers. Politicians and world leaders tell us that everyday. But more importantly than just needing teachers, we need passionate individuals who are ready to care about their students and change the way they think about education. That is why we are all here today. Somewhere along the road we decided that we want to be one of those individuals. For some, it may have been a gradual decision, determined after years of careful deliberation. For me, it was one day in kindergarten. With my pigtails bouncing and Spottie Dottie backpack, I knew I was destined to stand in front of a classroom one day. It does not matter how you came to sit here though, what matters is that our Junior class is united by the School of Education, and a dream to inspire. Throughout the years, my childhood plan never wavered. My desire to teach has only grown stronger with each new teacher I have encountered. In first grade, I wanted to be a first grade teacher, second grade, a second grade teacher, third grade, a third grade teacher and, you get the idea. Finally, upon entering high school, I knew I had found my niche. I loved the academic subjects, the atmosphere, the community, the extracurricular activities, the athletics, and especially, the students. At the time, they were my peers, but I looked ahead and saw myself at the whiteboard fervently singing a song about the quadratic formula and debating proofs of the Pythagorean Theorem with them. I’m a math nerd, what can I say. Regardless of what age group we have chosen, whether it is early childhood, elementary, or secondary, we each share a common goal: to be the best teacher we can possibly be. And we chose the Boston University School of Education to be our guide. This school is not just a teacher preparation program. SED is a welcoming community of supporting peers and professors who want to see us and our future students succeed. We share laughter on the bus rides during our Introduction to Education class, and relief upon completion of our first lesson plan. We listen to each other’s triumphs and experiences in the classroom and use them as ways to grow. My fellow students in the School of Education have become my best friends, my confidantes. We could not get through this journey alone, nor would we want to. The collaborations, class discussions, and stories we share about teaching, strategies, and learning opportunities are held more closely to the heart coming from those we care about, an education that not only a textbook could provide. Life in the School of Education is a constant reminder that “We can do this!” We can create interdisciplinary units connecting the sciences and humanities. We can manage a classroom and discipline appropriately. We can implement the curriculum frameworks and individualized education plans. We can educate and find a way into the hearts and minds of our students. Last semester I tutored one student at The English High School who informed me that he does not believe teachers when they tell him they believe in him. What does it take to believe? How can you show students that you truly care about them? It is a topic we have covered numerous times throughout the past two and a half years. Believing starts with respecting, moves toward building relationships, and arrives at a mutual understanding that one is at the blackboard because one wants to be there. We set high standards for our students, know that we will do everything we can to help them, and expect both parties to come through for each other. Passionately teaching what you love and showing your students that you care about them as learners, will make them into believers. After winter break, our district had a half day of professional development, where each school heard a presentation from the principal on “Learning Targets and Success Criteria.” We were encouraged to read this chapter from “Advancing Formative Assessment in Every Classroom” before the presentation. The presentation was followed by department break-out sessions to discuss the topic in more depth. Our district leadership has requested that all teachers post and share with students the “Learning Targets” and “Success Criteria” for each day’s lesson. They may be posted on a white board for the entire class, or teachers can choose to project them sometime during the lesson. 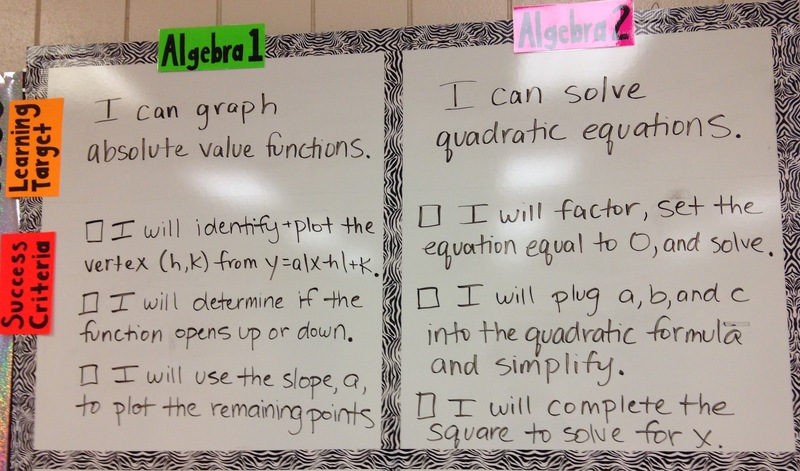 The key is that they are discussed with students and referred to throughout the lesson. “Learning Targets” are basically the same thing as objectives. 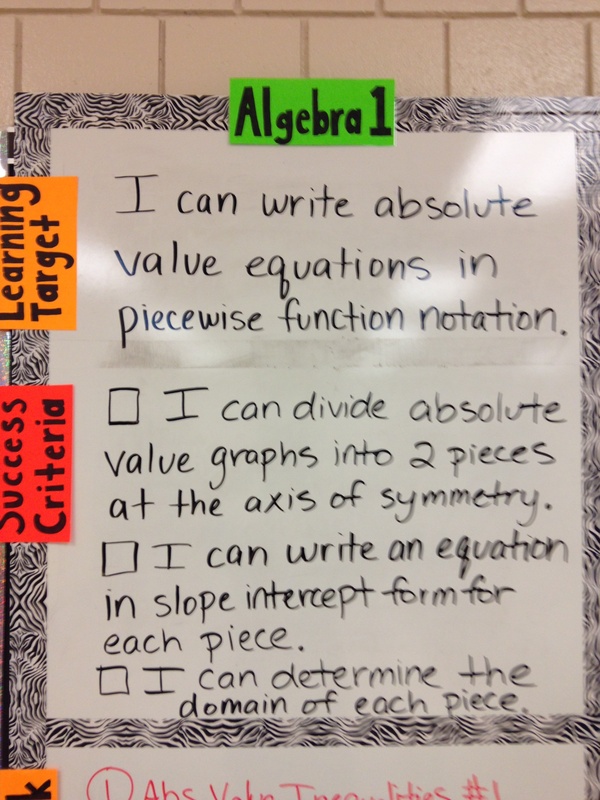 “Success Criteria” provide the student with strategies for assessing their work. The goal is for students to be able to explain WHAT they are learning and HOW they know if they are being successful or not. The target does not have to change every day. In my Algebra 2 example below, I planned to keep that target up for two weeks while students learned how to solve quadratic equations by factoring, using the quadratic formula, and completing the square. I have mixed feelings about this, as do many teachers at my school. Many feel that this is just another initiative that will disappear in a few years. And that it’s an awful lot of work to write each day. Myself, I really struggled with the language of the targets vs. the criteria. 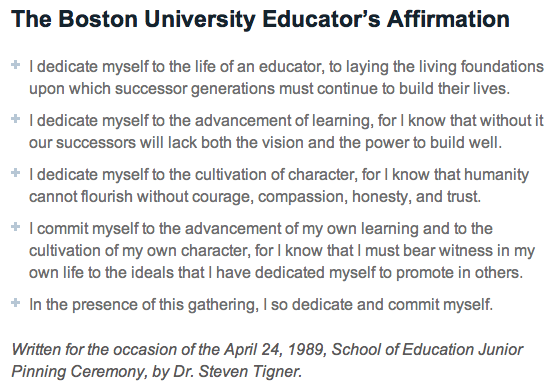 I originally posted mine as “I can…” followed by “I will…” But I saw other teachers posting it the reverse way: “I will be able to…” followed by “If I can…” and the wording really bothered me. If I have to do this every day, I need to be able to work with it. One of my colleagues suggested that I write ALL statements starting with “I can…” and this now really makes a lot of sense to me. The target is the big picture; what can students do at the end of the lesson? The success criteria is the target broken down into manageable chunks so that students can see where they are in the process. It makes sense that both of these are written as “I can” lists for students to mentally (or physically because I hand out a target list at the beginning of each unit) check off. So, we’ll see how this goes. Not sure if I’ll notice any changes in students’ understanding based on this required change, but it will definitely be a constant presence in my lesson planning now. If you have any experience with writing learning targets and/or success criteria, I’d love to hear from you!